In 1993 the North Shore Aero Club restructured their activities and sold the Great Barrier air service and commercial air charter work formerly undertaken by the aero club under the name Air North Shore. New Zealand Air Services Ltd was established by John Dale and picked up the air service between North Shore Airfield and Claris Airfield on Great Barrier Island and John Dale described the new service as “a complementary air service to existing services.” He told the Barrier Bulletin, "We want to see many more visitors to Great Barrier, and the more traffic between the island and the mainland the better." 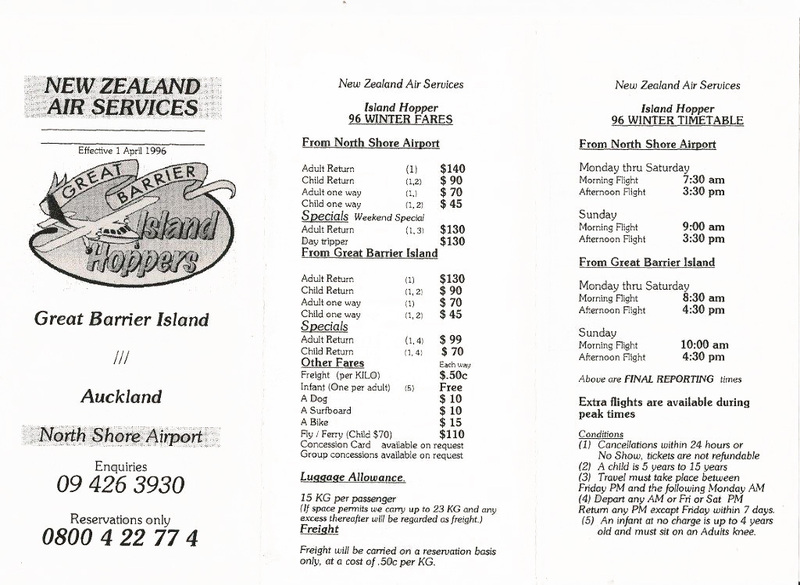 With North Shore Airfield’s closer proximity to Great Barrier Island the company was able to operate fares some $20 cheaper than those flying to the Barrier from Auckland International Airport. 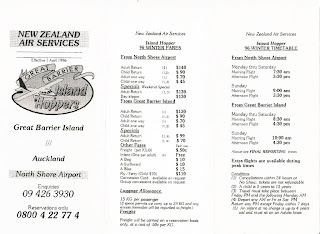 Flights commenced between North Shore Airfield and Great Barrier Island on the 9th of June 1993. Initially NZ Air Services hired various aircraft based at North Shore Airfield including amongst their types a Cessna 182, a Cessna 206, a Piper Pa28-200RT Turbo Arrow, a Piper Pa32-300 Lance, and a Partenavia. In April 1994 Pa32-260 Cherokee 6, ZK-DBP was purchased and reregistered ZK-ENZ (32-1117). This aircraft was no stranger to Great Barrier Island as it was previously owned and operated by Whangarei’s Northland Districts Aero Club/Executive Air Taxis on their own flights between Whangarei and Great Barrier Island. Piper Pa32 Cherokee 6 ZK-ENZ, 'Lil Island Hopper', at North Shore Airport on 28 November 1996. The new "Fly Barrier 69" service initially offered six flights each week, with a single return flight on Mondays, Fridays Saturdays and Sundays and a return morning and return late afternoon service on Wednesdays. 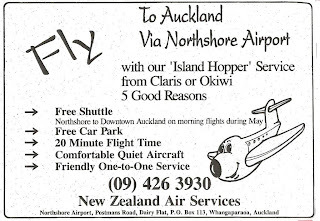 In July 1993 the Barrier Bulletin carried an advertisement which stated, “After the first month our new North Shore-Claris service we are overwhelmed by the support from folk on both sides of the water.” At this time the company also dropped the return airfare for islanders by $36 to $99 return. The service increased in popularity. 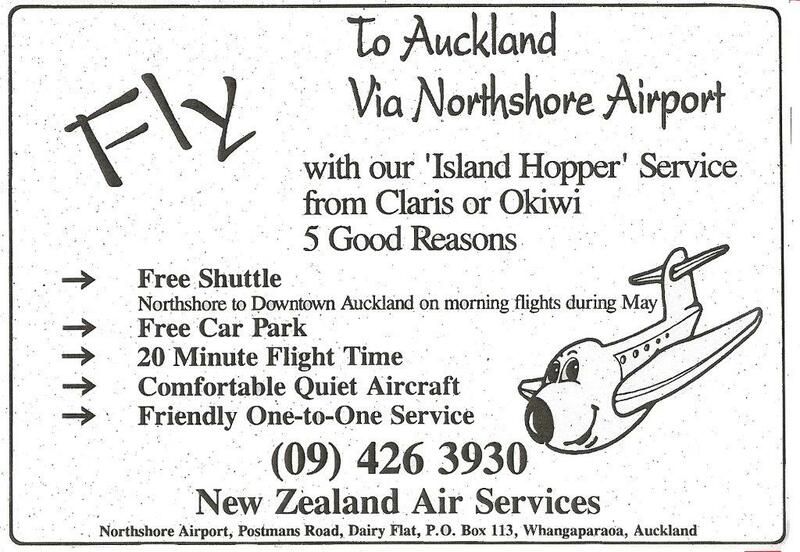 In 1994 it was rebranded as the “Island Hopper” service and landed at Okiwi as needed. By the end of 1994 two return services were offered seven days a week, usually a return morning and a late afternoon service. The company also offered a transfer shuttle service between North Shore Airfield and downtown Auckland, frequent flyer incentives, earplugs and lollies! With business growing Britten Norman BN2A-27 Islander ZK-WNZ (c/n 278) was added to the fleet in late 1995. This particular aircraft had seen service with Capital Air Services as ZK-DKN in the early 1970s. NZ Air Services Britten Norman Islander, ZK-WNZ, at North Shore on the 11th of March 1996. While NZ Air Service initially made a profit it was forced to cut prices to match its competitors when a real air war was being fought over Great Barrier services. Unwilling to carry the losses long-term John Dale, in a surprise move, offered to sell NZ Air Services to Great Barrier Airlines in October 1996 and a deal was struck. The North Shore-Great Barrier Island service continues to this day under the Great Barrier Airlines banner. The two NZ Air Services aircraft were painted in Great Barrier’s colours. The Islander was later sold but the Piper Cherokee 6, ZK-ENZ, is still part of the Great Barrier Airline fleet today.